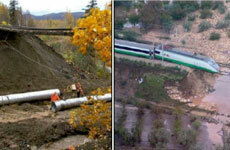 Culverts are essential elements of any railway infrastructure. Although there are commonly a large number of these elements in any transport infrastructure, its proper maintenance is often treated as a secondary issue when it comes to the management of ordinary maintenance investments. The aim of this work is to present a methodology intended to create strategies for prioritizing investments in culvert maintenance works. Applying risk assessment techniques, a preliminary diagnosis of the current culvert condition can be obtained, evaluating failure probabilities and quantifying socioeconomic impacts. At the same time, common pathologies and general risk factors are identified in order to determine the optimal solutions to the culvert current issues. Assessment of all culverts in a transport network allows to efficiently managing the investments in ordinary maintenance, optimizing the expenses and minimizing risks.